This is a delicious Crab Imperial recipe. Use it as a stuffing for your favorite fish or eat with baguettes. Remove all cartilage from crabmeat. In a medium size pan, melt butter, mix flour with a whisk. Slowly add cream, stirring constantly, to keep mixture smooth and free from lumps. Cook, stirring, over a medium heat until mixture comes to a light boil and thickens. Mix in Worcestershire sauce. Cool. Fold in lemon juice, salt, and pepper and seasoning to taste. 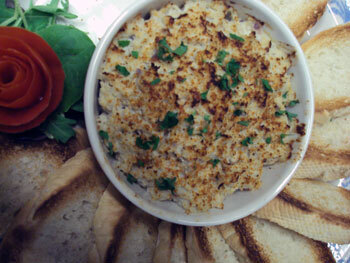 Fold in crabmeat and lightly mix. Put into individual shells or 1-quart casserole. Sprinkle with seafood seasoning, if desired. Baking at 400 degrees until bubbly and light brown on top- approximately 10-15 minutes.